A little boy decided to walk with me to the community center in Chambrun one day. Well, I’m back. Last week was amazing and refreshing and beautiful and….amazing. Last week I spent my days amongst some of my best friends, loving and serving others in a part of the world often overlooked by the rest. Last week I had fun, I played games, I told stories, I laughed and I cried. Last week I went to Haiti. I’m sure most of you know that I’ve visited that little island before. For those of you that just figured that out, last week was my third trip there. Every trip has been different, yet every trip has been a life-changing experience. I’m sure you’re curious about what I did or what it’s like down there, so I suppose I can fill you in on a few of the details. Haiti is beautiful. The people especially. The smiles on their faces make all the struggles of just getting to Hait worth it. I love the culture. Just driving around in town or visiting the village are some of my favorite things to do. Church was the key moment that changed my life and taught me what joy was on my very first trip. I’d fly down there every week just for church if I could. This week was a bit different than my previous two. It was supposed to be a mobile medical trip, but our doctor is having heart issues and was unfit for travel. Prayers for him would be much appreciated. As a result of his absence, we weren’t able to do mobile medical clinic. Instead, we helped out around the compound. It’s amazing how God’s plan always comes through in the most unpredictable of circumstances. Because our doctor wasn’t able to come, we had the manpower and funds to be able to paint the boys and girls children’s homes on campus. Both of these were a drab tan color, but we were able to paint them a dark teal and bright pink respectively, colors the kids themselves were able to pick out. This was the first time they’d been able to choose their own color, and they were squealing with delight (at least the girls; the guys were cooler about it). Aside from the painting, a small group of our team went over to the clinic and spent their days reorganizing files so patients can be seen faster. It used to take 20-30 minutes to find a person’s file, so their efforts greatly helped the staff and the patients they are able to see. The physical work is only a small portion of our week, though. I could talk for hours about all of the little things that we did or all the funny stories that happened. One of our favorite things to do there is to visit the village of Chambrun, a fifteen-minute walk from the compound. The team went four times, though I only had two full trips there because I was running around doing other things. Saturday we all had to get up at around 4:30 in the morning to get to the airport for our early flight. It was a long day of travel for us. Sunday was church as usual, which was just as amazing as ever. Like I said before, I would fly down every week just for church if I could. This year I even had an ornery little friend sitting beside me to harass me during service. She claims I was the crazy one, but if you ask me it’s a whole different story. Monday through Thursday were our work days. We’d go out after breakfast to our various painting or filing duties and work until about noon when lunch was ready. Typically rice with some sauce including beans and chicken. After lunch, we’d typically work until about three, then call it a day so we could hang out with the kids and go to the village. After lunch on Monday, I went into town with Matt Hickey to help get more paint for use in the clinic and for the waiting benches inside of it, as well as a few grocery items. We got a nice glossy white for the walls and a “seafoam green” color for the benches. The Creole word for that color is Bermudes if you were wondering. It may have taken a while to decipher what all the colors were because neither of us are fluent. I loved just driving around and getting to know the culture a little better. My favorite part of that day though was getting to talk with Matt. The Hickeys moved to Haiti several months ago, and I haven’t had the chance to talk with them face to face since they left. I think my favorite part of my whole week was just being able to talk openly with a group of people who understand my struggles and are just as committed to serving Christ as I am. After we were done with work on Tuesday, we went to the village. 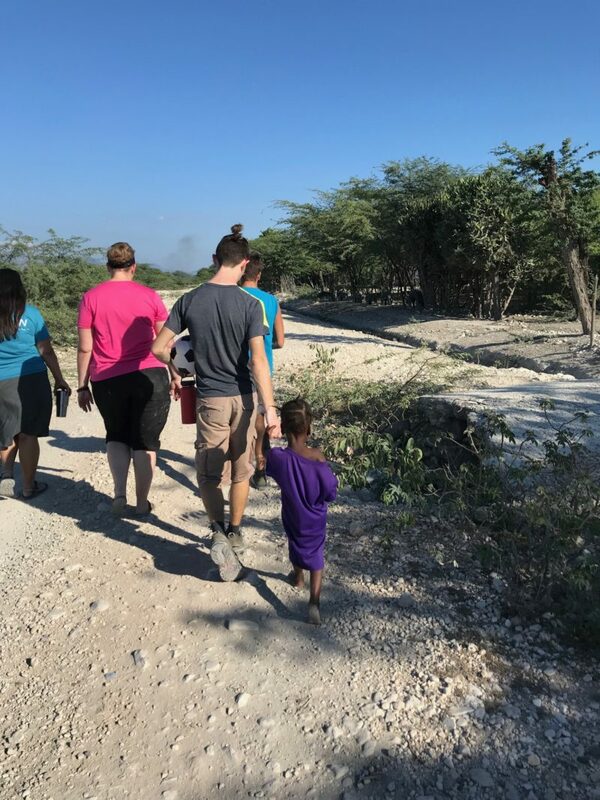 A few of us went with Makendi (the Haitian sponsor child program manager) to visit our sponsor children before rejoining the rest of the group at the community center NVM is constructing in Chambrun. I got to meet little Marie again, and although she’s still as quiet as ever, I’m happy to see that she seems to recognize me now and actually show interest, which she hasn’t done before. Hopefully, in the years to come, we’ll be able to develop more of a friendship. Wednesday was a special day. After work, we went to the village and got to hang out with several of the kids and even some adults from the village. Usually, it’s just the kids that come and interact with us. After spending a little time there, Adam (The American team coordinator for NVM) took us up the side of a mountain a few minute’s drive north of campus. He gave us his usual talk about Haiti and missions, about how this isn’t our mission field. I think I’ll write an entire blog on his speech later, so I won’t go into depth right now. I’m already past a thousand words anyway. That talk is always one of my favorite parts of my week. Thursday was our final work day. We finished up painting what we could in the children’s homes and moved over to the clinic to paint the walls and benches. At three we headed on down to the village one final time. I got to play soccer with a few of my team members and a whole bunch of Haitian kids wearing flip-flops or going barefoot. They kicked our butts. It’s amazing how good they are at moving that ball around, and they’re excellent at passing! Then again, they were facing a bunch of tired white people in the hot sun, so there’s that too. Friday is our rest day. We went to the beach and relaxed for a while. This isn’t always our favorite part of the week because we’d rather be back in the village playing with the kids, but NVM always makes sure our final day is one of rest for multiple reasons. For starters, it helps us re-acclimate to American culture and sorta lessens the culture shock of going from a third world country back to the US. Secondly, and most importantly, Pastor Pierre (founder of NVM) likes us teams to be able to see and appreciate the beauty of Haiti. He believes that God created this island full of beauty and peace, and he wants us to get a little taste of that so we’re not just seeing the brokenness. So, that was just a little of my week. I could talk for hours about all the amazing things I experienced there, but this is already twice the size of my normal posts, so I think I’ll end it here. I love Haiti. I always will. I can’t wait to go back there next year, but I know that God wants me where I am for a reason. Even though I’d rather be over there, I’m committing myself to serving God here just as faithfully as over there. After all, y’all need Jesus just as much as those Haitians in Chambrun do. I hope this post has helped you see a little bit more about my life and what Haiti is like. I’m happy to talk with you and answer any questions you have, so don’t hesitate to email me or post in the comments. I’d never pass up an opportunity to talk about that island I love so much. Sounds like that Boy Scout Painting badge came in handy! Glad you are having these experiences.